Fans have been eagerly anticipating what Nickelodeon has planned for SpongeBob SquarePants’ 20th anniversary, which is on the first of this May. And it looks like the network will be celebrating with a special birthday episode! 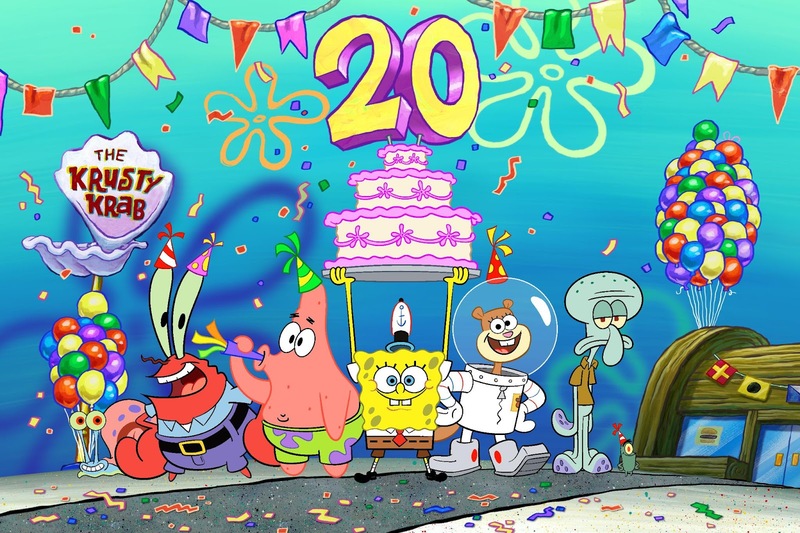 A recent listings report from Production Weekly has revealed that Nickelodeon is working on a birthday episode which seems to be titled as "SpongeBob’s 20th Birthday". Work on the episode is expected to start on February 5th in Los Angeles, California. 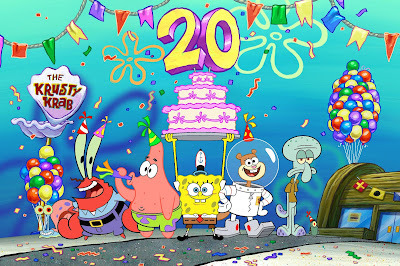 Update (2/12): Nickelodeon has announced the exciting news that they'll be celebrating 20 years of SpongeBob SquarePants with the “Best Year Ever,” kicking off Friday, July 12 with a special birthday episode! SpongeBob SquarePants first debuted on Nickelodeon USA on May 1, 1999 and is still going strong. Since its launch in July 1999, SpongeBob SquarePants has emerged as a pop culture phenomenon. The series has been the most-watched animated program with kids 2-11 for more than 15 consecutive years, and over the past several years, it has averaged more than 100,000,000 total viewers every quarter across all Nickelodeon networks. SpongeBob SquarePants is the most widely distributed property in Viacom International Media Networks history, seen in more than 208 countries and territories and translated in 55+ languages. The character-driven cartoon chronicles the nautical and sometimes nonsensical adventures of SpongeBob, an incurably optimistic and earnest sea sponge, and his undersea friends in the fictional underwater city of Bikini Bottom. Among those friends are SpongeBob's best friend, a pink starfish named Patrick Star, his neighbor and co-worker octopus Squidward Tentacles, and Sandy Cheeks, a squirrel from Texas. SpongeBob SquarePants is created by Stephen Hillenburg, who previously worked as a writer, director and creative director on Nickelodeon's animated series Rocko's Modern Life. Hillenburg graduated from the California Institute of the Arts with a master's degree in experimental animation and his undergraduate degree, from Humboldt State University, was in natural science with an emphasis in marine biology. Hillenburg executive produced the series until his untimely passing in November 2018. His first feature film, The SpongeBob SquarePants Movie, which debuted Nov. 19, 2004 and his second theatrical, The SpongeBob Movie: Sponge Out of Water, hit theaters Feb. 6, 2015, landing at #1 opening weekend. SpongeBob SquarePants has been renewed through to at least the show's twelfth season, will be celebrating its 20th anniversary in 2019, has its own critically acclaimed Broadway show, set to tour the U.S. from Fall 2019, and has a third upcoming movie, The SpongeBob Movie: It's a Wonderful Sponge, set to be released in Summer 2020. The series is produced at Nickelodeon in Burbank. SpongeBob has also been making news for a different reason as well and it involves paying tribute to the late Stephen Hillenburg, the creator of SpongeBob SquarePants. A petition which calls for a SpongeBob Super Bowl tribute featuring "Sweet Victory", a song featured in the series and a favorite among fans, for the show creator has gained immense traction. From the looks of it, fans’ effort to get a Super Bowl tribute seems to be a success. A recent promo video released by Maroon 5 on their official Twitter account has teased that the band has something planned to pay their tribute to Hillenburg. Originally published: Thursday, January 24, 2019. Original source: Pursue News; Additional source: Twitter /@TheAGames10.